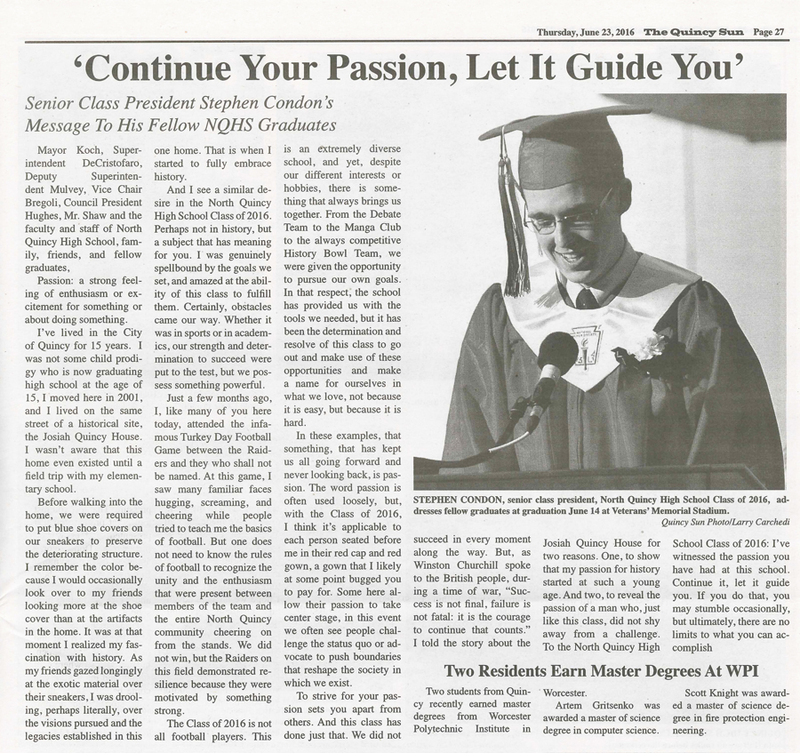 It was so nice to see, in the June 23 edition of The Quincy Sun, a reprinted message from Stephen Condon, this year’s North Quincy High School senior class president. During his graduation address he encouraged his fellow classmates to “continue their passion.” He spoke of his love of history and how it was inspired by an elementary school field trip to Historic New England’s Josiah Quincy House. That is when he realized how fascinated he was with history–and he found it in a historic site on the street where he lived. We hope that Stephen has a chance to stop by this year and explore the changes we’ve made at Quincy House. We believe Stephen participated in our Family Ties program there. Family Ties shows students how to chronicle their families’ stories by conducting oral history interviews and examining historical documents, objects, and photographs. See what inspired Stephen by taking a tour of Quincy House, first and third Saturdays of each month through mid-October.